I have to say that the turmoil of 2016 had a strange effect on me, which in this case isn’t a good thing. Luckily The Shacks do offer some relief at this time of year which ultimately is not really strange… but still very likable. The debut EP of the youngsters Shannon Wise (18) and Max Shrager (20) starts with the 60s hit record ‘This Strange Effect’ that was penned down by Ray Davies of The Kinks. The husky voice of Wise gives the original a very lustful wink that instantly brings up a certain, well let’s say ‘craving’. Heck, I never disliked the original but this is the version I have been waiting for all of my life. I can only imagine waking up on a saturday morning, or whenever really, as this cover is being whispered in my ear. 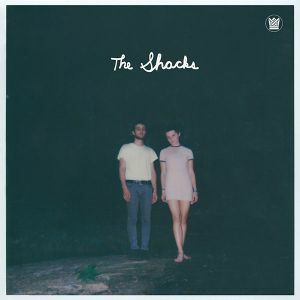 The Shacks however are more than just a cover band and bring much more to the table. Separate from each other Wise and Shrager both have a strong musical upbringing. Wise has always been surrounded by music as her father managed a recording studio in New York, and her mother was a singer-songwriter. Shrager started pioneering from the age of fourteen as he eventually wrote a piece of music that was picked up by Daptone Records in 2014 which became the lead single ‘Sinner’ on a release from Naomi Shelton and the Gospel Queens. Wise and Shrager found each other in high school and after a short tryout of ‘Strange Boy’, the closing bonus track on this EP, The Shacks were born. ‘Strange Boy’ could be just the song to describes The Shacks music best. Its fuzzy, soulful, intimate and is unwittingly catchy because clever placed slow mo doo-wop choir on the background. In the 22 minutes between ‘This Strange Effect’ and ‘Strange Boy’ The Shacks make clear that it’s a matter of time time before they find a larger audience. The infectious voice of Wise carries much, or maybe all, of this adventurous EP which every now and then taps into the eclectic desert funk we heard earlier on The Echocentrics this year. ‘Tidal Waves’’’ lovely groove for example could easily be part of the Pulp Fiction soundtrack while ‘Orchids’ has a more serious undertone in it. The Timber Timbre-like break and sax bring in a dusty romance that halfway through surprisingly turns into a sparkling sunset on a the Jamaican beach. Throughout the EP Wise’s smoky, sleepy-eyed vocals strongly remind of Binki Shapiro of Little Joy. ‘Left It with the Moon’ serves an almost direct reference to Little Joy. With Wise in the center the band creates a delightful lullaby by lightly touching bossa nova and fado. Here she sings: “And my heart still gets so tired of spending my nights searching for you. For the love that I desire stole my heart and left it with the moon”. If that isn’t enough the band keeps it warm with a reggaeish rhythm section on ‘Hands In Your Pockets’. Wise her singing is less fragile here and eclectically transforms into the elegant confidence we know from Jennifer Charles of Elysian Fields. The Shacks first steps in the industry are indeed drenched in nostalgia but also are strongly rooted in a certain youthful sense of adventure. And 2017 will all be about adventure right? Anyhow, I for one simply can’t wait for their debut LP to land somewhere in the new year. This entry was posted in WRM and tagged 2016, Big Crown Records, Binki Shapiro, cd, Daptone Records, Desert Funk, Elysian Fields, EP, Jennifer Charles, Little Joy, Max Shrager, Naomi Shelton and the Gospel Queens, New York, Pulp Fiction, Ray Davies, review, Shannon Wise, The Echocentrics, The Kinks, The Shacks, This Strange Effect, Timber Timbre. Bookmark the permalink.